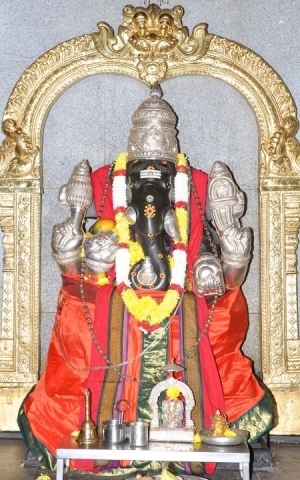 Seated majestically in the center of the Mahã Mantapam, the Prayer Hall in His Sanctum Sanctorum is Šri Mahã (great) Vallabha (omnipotent) Ganapati (Leader of the ganas, the guards of Šri Šiva), the presiding Deity of this Temple. Šri Ganeša has the inherent powers to remove obstacles; and as such, is the first Deity to be worshipped. Šri Ganeša can be readily identified by his elephant face and a human body with four hands and a big belly. Šri Ganeša would give us the confidence to embark on all things big and small, with the assurance that He would take care of all the obstacles that come our way. Šri Siddhi-Buddhi sameta Šri Mahã Ganapati (Utsavar) : In front of the Ganeša sanctum and to one side is the metal image of Šri Ganeša, along with Šri Siddhi and Šri Buddhi, His Divine consorts can be seen seated majestically on an ornate silver chariot. They are the šakti or energy of Lord Ganeša, Who would bless us with fulfillment and wisdom, respectively, which are needed for us to complete what we start, while overcoming any obstacles. As with other Utsava Vigrahas, these idols are moved around during festive days.